When you are constructing your ultimate gaming setup, after you have your desk and microphone sorted you might want to add a finishing touch in the form of a stand for your headset. These are not really an essential part but will give you a nice look and keep things tody when you are not using them. 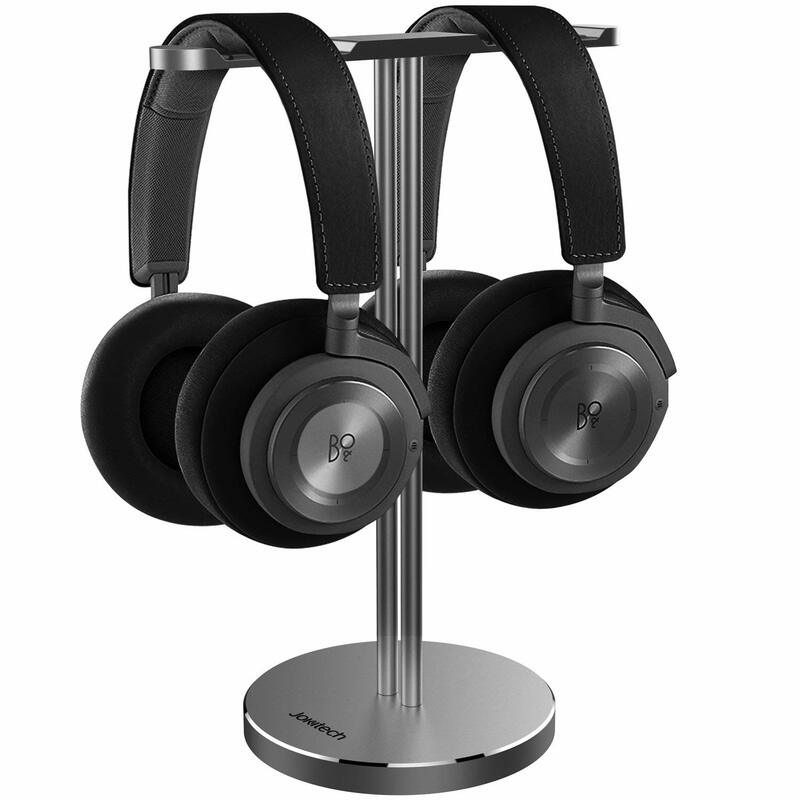 They help to stop your wires getting tangled and if you have spent some money on a decent set of headphones then why not display them in style? A clean and tidy desk can also help you productivity if you are working and can give you an edge if you are competitively gaming online against others. A stand can also help protect your headphones against damage, plus they look cool! We have spent hours researching the different options available to you and put together another in-depth buyers guide for our readers. Take a look below as we have picked 10 different choices to suit different styles and budgets. 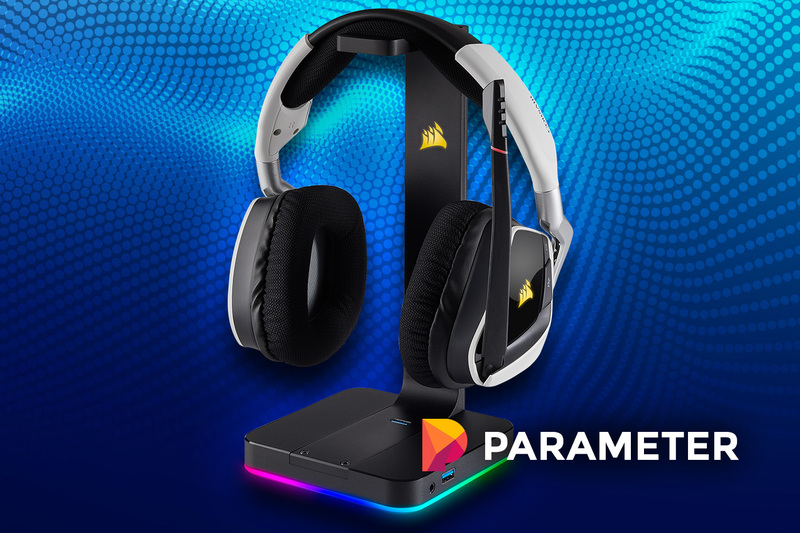 CORSAIR ST100 RGB Premium Headset Stand: this is a premium headset stand that includes all the high-end features professional gamers might like to have. Avantree Aluminum Headphone Stand Headset Hanger: One of the more basic, but still high-end options is this stand. It has an elegant design that will definitely spice up your décor. COZOO Desktop Gaming Headset Holder: if you need something to power your console or simply to extend the power source you are using, this will be a great option to choose. Elevation Lab Under-Desk Headphone Stand Mount: It might not be the best option we have on this list, but if you need something cheap and basic, this is the ultimate budget pick. The CORSAIR ST100 RGB Premium Headset Stand is one of the best-looking stands we could find. 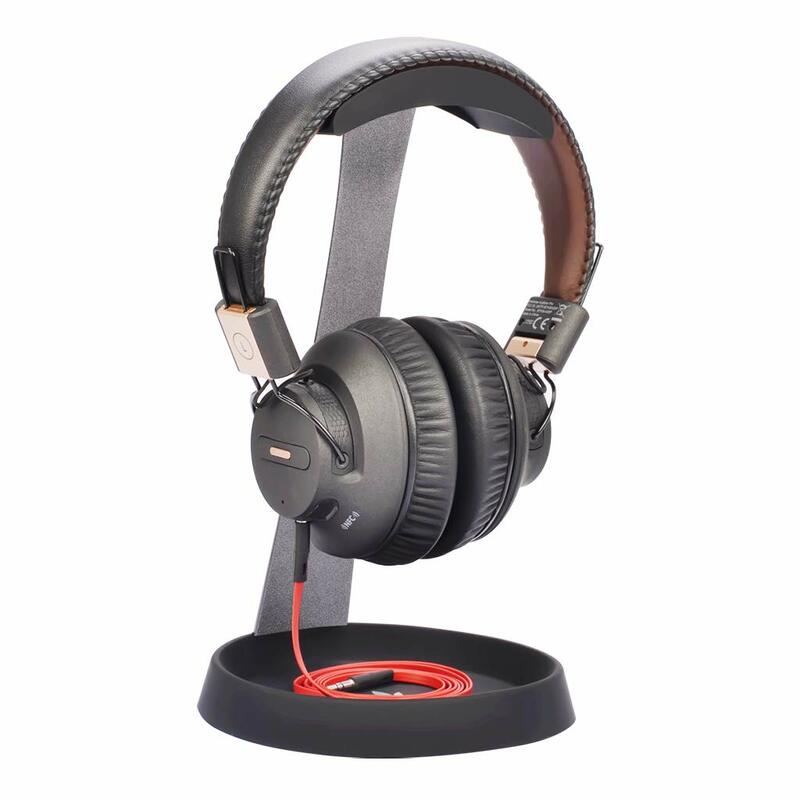 It is designed to sit on your table and keep your headphones out of your way if you don’t need them. It has been constructed from thick and durable aluminum that should hold the headphones quite nicely while adding some durability. With a 10-inch height, it should be efficient when it comes to holding most headphone types and the stand itself can light up to make it look a little more spectacular. The lighting options cover all 9 of the common zones, which means that you have some unlimited lighting potential and can choose whichever option matches your headphones. One of the key features is the 3.5mm input that will enable your 7.1 Surround Sound for a multi-channel audio experience across the board. The dual USB 3,1 inputs enhance your overall data speeds and will help the headphones charge at a much faster rate as well. Additionally, the base features a non-slip rubber design to keep it firmly planted on your desk. While finding downsides with this product can be quite hard. It does have an issue when it comes to matching the colors of other Corsair products. You might need to play around a little to ensure that it does work. It is also worth noting that it can be used on Windows without even installing the software and still work. If you were ever worried about the price, you can rest assured that you are getting what you paid for. This headset stand is one of the very best tech stands on the market today and it comes at a reasonable price as well. We would definitely recommend it to avid gamers or any other headphone enthusiast looking for a stand. The Avantree Aluminum Headphone Stand Headset Hanger is another state of the art option that comes with virtually everything that you could need to keep your headphone safe. It has also been constructed from durable aluminum and while it does not have surround sound, it will hold up quite well to table bumps. At the bottom, it features a silicone cable holder and this will also serve as the base of the unit. It should offer you a non-slip experience, by keeping your headphones fixed in one place. Additionally, the cable holder can be efficient at making sure they don’t get tangled up with everything else that might be on the desk. One of the features that makes it so versatile is the ability to also hold your mobile device in multiple positions. Since it can hold your mobile device and your headphones, you won’t have to deal with as much clutter being on the desk. We have also seen that it is compatible with the most common types of headsets sold today. The headphone design might not be perfect and even though you can have a few wobbles scares, it does not ever look like it wants to fall over. If you do have a bump to the table, expecting a wobble or two might make you cautious. However, we have tested it and the headset stand does not actually tip over. Adding a weighted object inside should remove the wobbles. Since this is not a tech product, but more of am basic headphone stand, it is not as expensive. The stand has been designed to simply do one job and it will do it quite well. Even though the materials might feel a little cheap, you don’t need to worry about them breaking anytime soon. This is definitely a good basic headset stand. As an avid gamer, you will definitely know how hard it can be to keep your headphones fully charged, especially when they work with a Bluetooth connection as many modern options do. 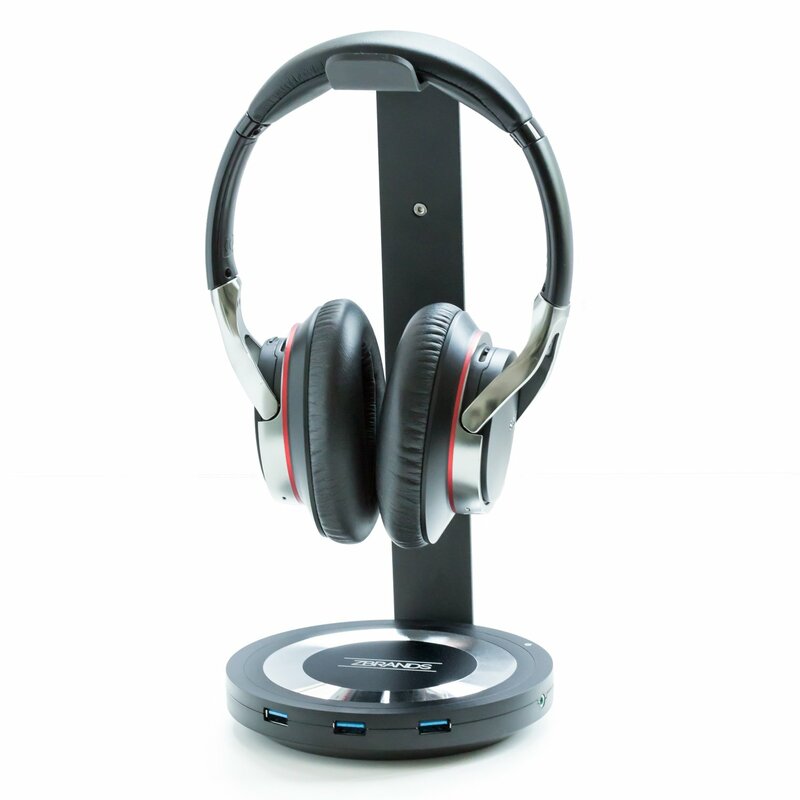 The COZOO Desktop Gaming Headset Holder is a universal headset stand that can actually sever as a USB extender as well. Since it features 3 USB ports, it can be used to charge all of your mobile devices and even your headphones when needed. You simply need to plug it in and you will be ready with a power source. The USB ports have a power output of 2.4 amps and this means you will have a faster than average charging speed for your devices. Since it has been designed from hardened plastic, it can hold up well when it comes to circuit problems. With so many different ports and even potential wires, this can always be a possibility that you will need to look out for. Additionally, it also includes a microchip and this should ensure that all your devices will remain on the safe side. While many people might be a little worried by the 2 AC power outlets that could put too much strain on the headset hanger, it has been designed to give you an output of 1250-watts. This can be enough to actually power your PS4 and it is also compatible with most consoles or gaming devices you might be using. As for the price, this is the only actual downside that we could find and unfortunately, it is one of the most expensive options on the market today. It does include a decent 2-year limited warranty that will give you some peace of mind, but if you need a basic headphone stand to keep them out of your way, this one might be a little overpriced. 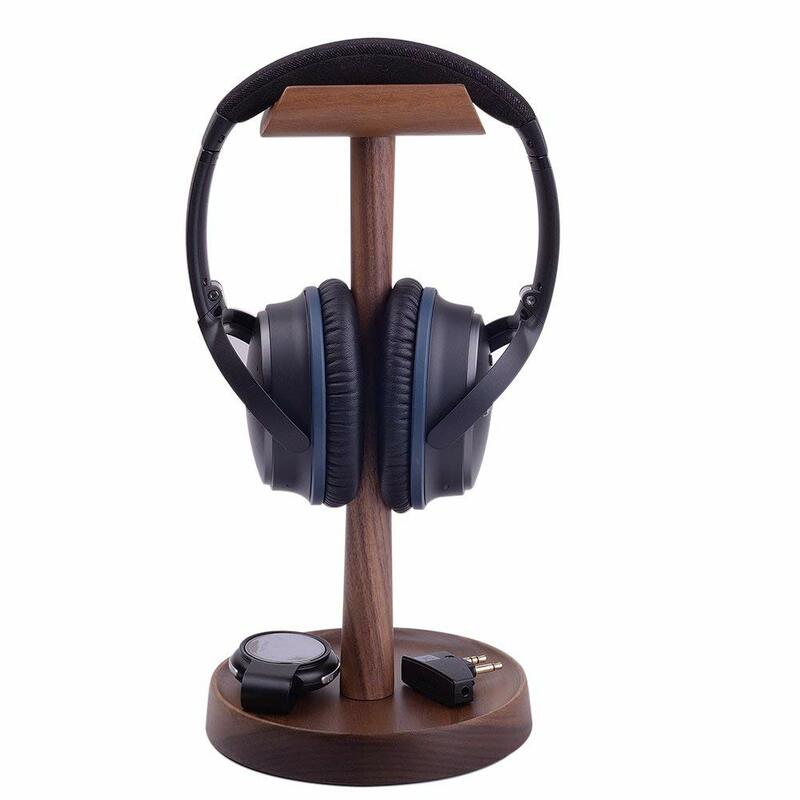 When looking for a headset stand, we always try to look for something that is extremely stylish and this is exactly why we have included the Wooden Omega Headphones Stand. It is another basic stand that features massive durability. However, the wooden construction is what makes it look exceptional on your desk. It is 10-inches tall and can take most headphones that are on the market today without forcing you to set them up in a specific way. When it comes to thinner headphone designs, you could potentially even squeeze two of them on the stand and it is also compatible with most headphone brands that we could get our hands on. 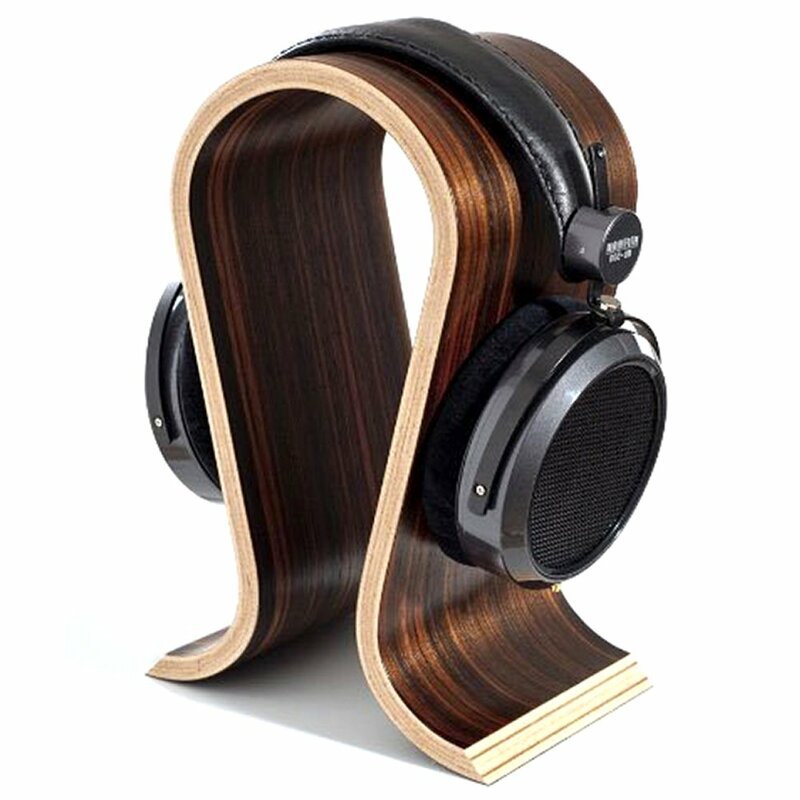 The design can go either way, with many people finding the design to be a little boring and other believing that it is one of the best-designed headphone stands for elegance. 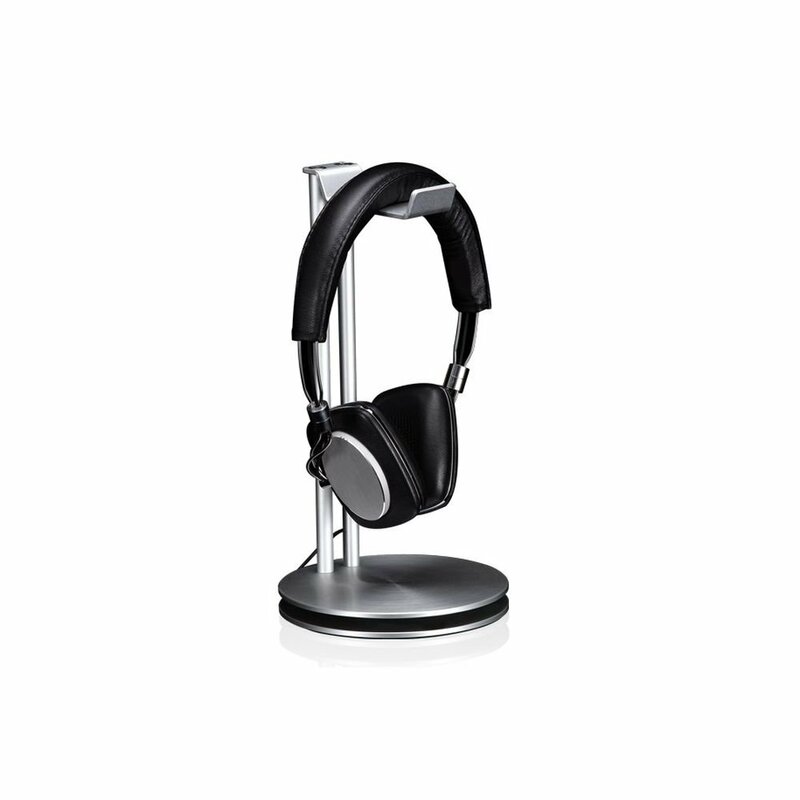 We like it, as it can be used as an ornament on your desk as well and you might not even think it is a headphone stand until it is being used. The durability of this stand might be really high and with rubber feet, you can be sure your headset is not going anywhere. However, the coating does not seem to be sufficient and they are not scratch resistant. Many people have added a coating of their own to help improve the design and make it potentially scratch resistant. If you are looking for something basic, this headphone stand might come across as a little expensive to many buyers. However, it does work well to make your desk more elegant. Since less is more in the modern era, we have decided to include these headphones for their ability to stand out from the rest of the crowd. If you have two headsets, why should you spend so much money and buy a second one when you can simply find one that will hold both. The Jokitech Aluminum Alloy Desk 3 Headset is the perfect option and it has also been constructed from durable aluminum alloy, which has been coated to be scratch resistant when it falls. What makes this stand so efficient is the ergonomic design and the additional leather pads that have been added to the top. If you have cushioned headphones, these cushions will now be protected and you won’t need to worry about any indentations that could miss form them. Silicone has been used for the bottom area to keep it slip resistant. We like the fact that you can use this headset stand with only one headset. It won’t be off balance and you won’t need to worry about it tipping over at the slightest of bumps either. The design looks rather elegant and when it is not in use, it should spice up the look of your office or even your gaming desk as a whole. While the bar on the top does have a soft spot for your headphones, the rest of it can be sharp and cause a few problems as well. We would recommend being careful when placing your headphones on top of the stand to ensure that you don’t need to deal with any damages. Aside from this, it is heavy and actually quite sturdy. Once again, you don’t need to be too concerned about the price of this option. It is actually really affordable and since it gives you the option to hold 2 of your headsets, you get 2 for the price of 1. The assembly is also easy and you won’t even need to have any specialized tools to have it complete and ready for use. Making it onto our list next is the Artinova Wooden Headset Holder and this is another unit that has been designed to improve the overall style of your desk. Made from high-quality walnut wood, it has been coated and should be durable enough to last you a couple of years before it starts to deteriorate naturally. We love the fact that if your headset has not been placed on it, it looks like a normal ornament that you have added to your home. The round base is fitted with rubber pads for stability, but since it weighs around 10-ounces, the stand is also heavy enough to remain firm and offer you some sturdiness when it comes to your headset. The overall design is not just made for your headset, but if you have a cable that needs to be stored, it can easily be wrapped around the stand and keep it safe or out of your way while you are not using it. We have tested it to be compatible and easily hold most of the common brands without any issues or adjustments needed. The only real complaint we have is that it needs to have some sort of padding on the upper bars. Since it does not have this padding, it might leave indentations on the padding of your headsets. However, this damage is not permanent but can cause some issues if the headset is left there or not used for some amount of time. Once again, it is an affordable option that can amp up the overall look of your desk and ensure that your headphones are fully protected. As we have already mentioned, the wooden base is quite sturdy and stable as well. If you don’t need any tech features to support your headset, this will be an excellent option to buy. For a modern headset stand, it seems like an aluminum construction is the main way to go. 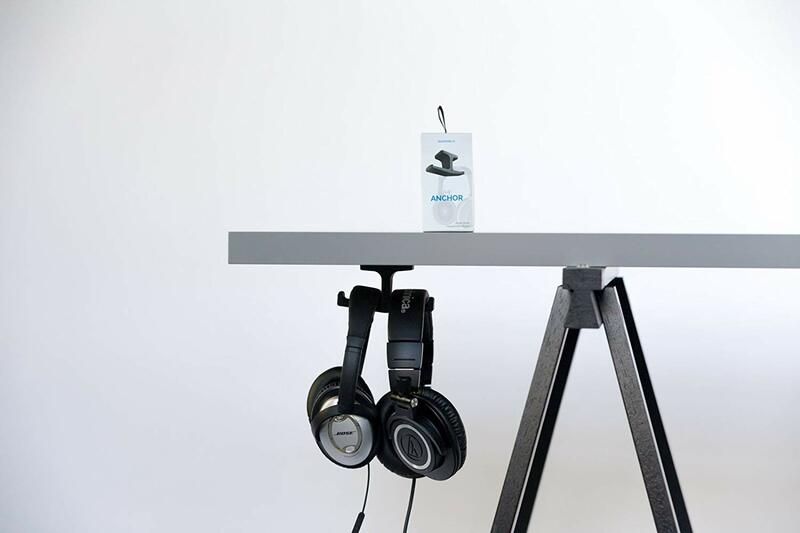 The Just Mobile HeadStand is a fully constructed aluminum unit that will not only hold your headset but also look decent enough to be left on your desk alone. It is available in numerous different color as well, which gives you more options to choose from. When looking at the design, it might seem that the double panel design that is connected to the stand is in the way. However, this is not the case and it serves as the perfect solution to wrap your cables around and keep them out of your way. The foot piece is thick and heavy, firmly planting the stand into the ground for more stability. While you might be looking for headphone stand, this one can actually help you keep your earphones safe as well. The design allows for the cable to be wrapped up and the earpieces to be protected on the desk. It serves well for keeping some of your smaller items like chargers as well but does not include the charging ports. As we have mentioned, you can find it in numerous different colors, but over time, the color might start coming off if the headset is not carefully taken care of. It is scratch resistant for the large part, but nothing is perfect. We do recommend placing it somewhere that will keep you from bumping it over too often. Unfortunately, the price is another area for concern and this might be a little overpriced for many people looking for a basic stand. The upside is the style and the ability to keep your wires out of the way when you are not using them. It is worth noting that the Just Mobile HeadStand is compatible with Apple accessories. Having a USB stand offers you more versatility and functionality when you are not using the stand. 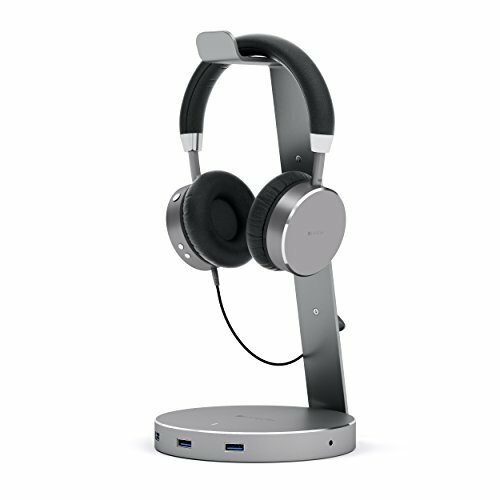 The Satechi Aluminum USB Headphone Stand is constructed from solid aluminum and features a stylish coating that makes it look great on your desk. Since it has a small footprint, it will also remain out of your way. What makes it special is the 3 USB ports that have been added. These USB 3.0 ports will efficiently charge many of your devices without too many hassles. It is also backward compatible with devices that still use USB 2.0 and 1.1, but this might not be able to charge all of your devices as fast as the newer USB will. You can also plug in your headphones with the 3.5mm standard AUX port and this makes it possible to communicate without even listening directly into them. Rubber has been added to the bottom of the footprint and this will ensure that headset is stable and secure when left on your table or if someone bumps it. While it might have the charging ports added, we have found them to be a common issue. You will need to use a good quality charger if you want to charge everything and we don’t recommend charging too many things at the same time. If you want to charge your devices, it is better to charge them one at a time for the best results. When comparing it to some of the other USB headset stands, it is actually one of the most affordable options currently available on the market today. It has everything you find in the high-end options, but with a low-end price tag. If you are breaking into the world of gaming, this will be an excellent beginner option to consider. The ZBRANDS Premium Headphone Charging Stand is another newer model that not many people know about, but it definitely makes a massive difference to your home. It has been constructed from heavy-duty aluminum and with a weight of over 1-pounds, it will definitely offer you some stability and sturdiness for your headset. Having three state of the art USB 3.0 ports is definitely beneficial when you want to charge your headphones or mobile devices. It can also serve as a USB extender and you don’t need to worry about slow charging speeds. The standard 3.5mm AUX port has also been added to the mix and this should ensure more versatility. We love the fact that your headphones will always look good. However, the flat surface on top of the footprint can also be put to good use for holding some accessories. You can also sort out all of your cables with the cable management setup and this will keep them from being tangled in your drawer as most people have it. While it might have everything that you could ever dream of, the performance does feel a little cheap. However, it will still get the job done. We have found that charging multiple devices does not really bring down the charging speed, but you should not use the devices or it might actually take more power than it can put out. As for the price, it is affordable and has the same price as many of the normal headset stand that does not have any tech features included. Once again, this stand looks exceptional and should be a great option to have on your desk. We recommend it as the perfect budget option for those in need of a gaming headset stand. Last but certainly not least, we have the Elevation Lab Under-Desk Headphone Stand Mount and this basic headset stand is designed from pure silicone. It looks stylish and you don’t have to worry too much about the setup as it simply attached to the bottom of your desk to hold your headsets when they are not in use. What we love about this stand is the simplicity of the design. You don’t need to worry about all the fancy features and other accessories, you can simply add 2 headphones and they will remain in place. Since silicone is used, there is no need to worry about indentations in your pads, but still some durability. It does have a basic design, but the only real flaw is the fact that headsets might easily fall off when the table is bumped. You might need to have some sort of lock added to keep them in place. If you don’t have 2 headsets, you have versatility as one side can be used to manage all of your cords and cables quite easily. Since it is really basic as you might have noted, it is one of the most affordable options on the market today. You simply need to stick the adhesive to your desk and you won’t need to worry about a thing. It uses the same adhesive as the GoPro devices, adding some peace of mind. We recommend it as a quick fix for those on a budget. Under The Desk: These headset stands have phased out quite a lot in recent years and they were once considered the best options. What makes them great is that they don’t need to be placed on your desk and they will remove clutter. Basic: The basic type of headset stand is one with not tech features and it simply features a footprint and a hook. The hook is used to hold the headset, but you can also use the top of the footprint for other accessories and cables. Advanced: if you are looking to use the headset stand to actually charge some of your devices, this will be the way to go. These headset stands are fairly expensive but include USB ports for charging. They also take some more time to assemble. No matter which one you choose, they will all serve the main purpose of keeping your headsets protected from potential damage. However, having an advanced option is better for the long run and you don’t need to worry about upgrading if you need to have a charger or USB extender. Design: Once you have picked the right type or decided which of them is the best for you, you will need to look at the design. Having a blad design that does not complement your home or even improve your décor, is not effective. Whether you choose the wooden options or those constructed from durable aluminum, you need to find one that can actually stand alone and amplify your décor. Cable Management: The cables we commonly use for charging are often thrown into our drawers, but after time, they will become entangled and can even sustain a little bit of damage. It is best to look for something that will keep your cables sorted. Most of the headset stands on this list have been designed to make sure your cables are cared for. Durability: The durability is directly attributed to the construction and while you might love something made from plastic, it might not last as long as your aluminum or even wooden options. When it comes to durability and style, the wooden options and the aluminum options will offer you the best of both worlds and ensure that your headset is protected. Fit: If your headphones don’t fit on the stand, it will be a complete waste of your money. Generally, these units will indicate the brands that they are compatible with. However, we have found that most headset stands are now designed for universal purposes, which means they should work well with most of the common brands. Price: Last but certainly not least is the price. You definitely need to ensure that you find something that you are going to be using. Having too many tech features might not even be needed and could spike the price quite significantly. We recommend sticking to your budget and you might find good options at affordable prices. Why Do I Need A Headset Stand? This is probably the most common question that many people have and some even consider it a complete waste of time. However, the headset stand can serve a couple of purposes and this includes making sure that your headset is not in the way. Spillages on the desk or even bumps might knock it over. Additionally, the serve as a way for you to manage your cables and instead of simply tossing them into a drawer, they can now be wrapped up to keep them safe and protected. 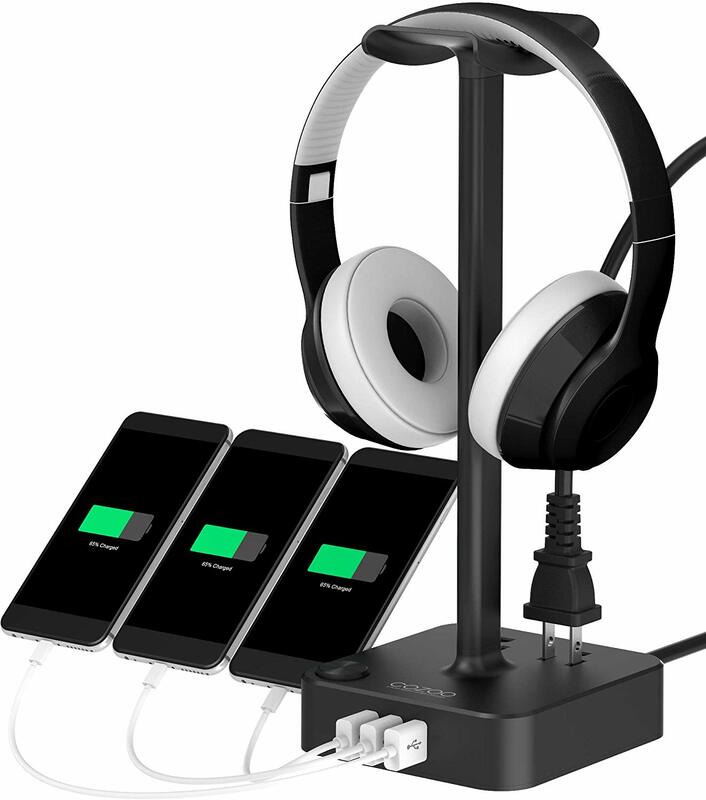 The headset stand can also serve as a USB extender to help you charge some of your devices while looking great on your desk. Are These Stands Sturdy? The sturdiness of your stand will greatly depend on the materials that have been used for the footing. If the stand is solid at the bottom, it might still slip. We have recommended silicone or even rubber for the footing and it will definitely keep the stands firmly planted on the desk to avoid any potential hassles that might occur. Is there any software installation? Many of the high-end stands will need some sort of software to be installed when it is connected to your PC. While Corsair does recommend installing the software, we have found it to be really versatile and the stand can work without you installing the software. However, this is only the case for Windows Operating Systems. What Is The Ideal Weight For A Solid Headset Stand? Unfortunately, there is no real weight that will be perfect, but we have found the stands that are close to a pound to be really sturdy when they have been placed on your desk. The sturdiness will depend on the construction and wooden stands are little heavier than your normal aluminum stands. Choosing the best stand from this selection is quite hard. There are obvious stands that do stand out above the rest, but they all serve the same common purpose of keeping your headphones from being damaged and reducing wear and tear. 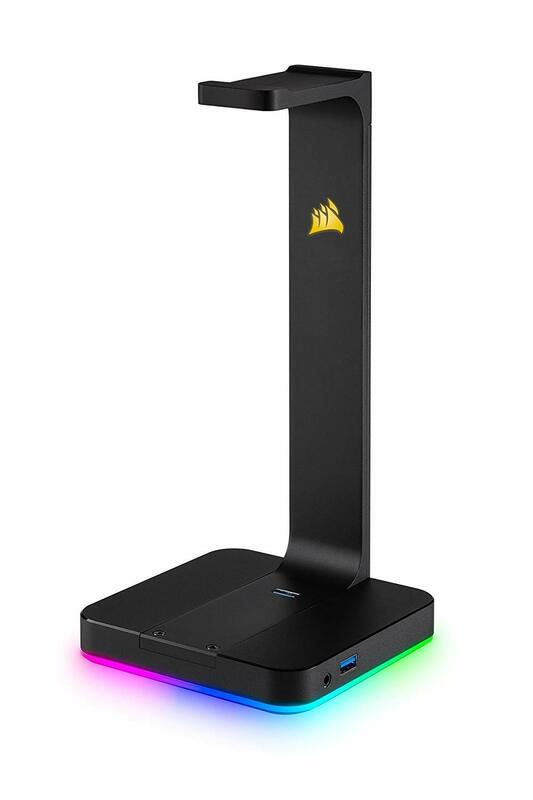 The CORSAIR ST100 RGB Premium Headset Stand is one of the best and it is from a reputable brand. We would highly recommend it as the number one pick on this list. We would like to thank you for reading this article and encourage you to share some of your thoughts on these stands. Let us know which of them you have used and if we might have missed one of your favorites. We would love to review any other great suggestions that you might have for the best headset stands.